Kobichya vadya (plural) is a delicious accompaniment with daily meal or can be served as a snack. Here's how my mom makes it. 1. Mix cabbage, onion, coriander leaves. 2. Add all the remaining ingredients one after the other. 3. Add water gingerly to make a thick batter like you would make for making pancake. Pour in a greased pressure cooker container. 4. Steam in a steamer or pressure cooker. If using pressure cooker, steam without using the weight. 5. Take it out and let it cool completely. 6. Cut the cooled batter into squares or diamonds. 7. Heat a tawa or pan. Shallow fry the squares/diamonds till all the vadies get crispy. 1. You can add some ginger garlic paste to enhance the taste. If using, add 3/4 tsp for the above recipe. 2. As always, when deep fried they will taste even better. But I prefer shallow frying to cut back on calories. 3. I used a combination of green and purple cabbage. Moong dal is soaked and ground into batter. The batter is poured onto hot pan as thick dosa and cooked till soft. The dosa is then teared up and cooked in tomato masala sauce. Serve moong dal dosa curry with steamed rice and dollop of ghee. Makes: around 4 Servings of Moong Dal Dosa Curry. Soak split moong in water for 1 1/2 – 2 hours. 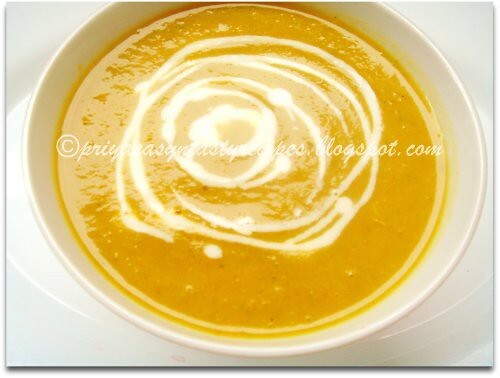 Strain the soaked moong dal and grind it into smooth paste with sufficient water. Add sufficient salt to the thick batter. When pan gets hot, pour a ladle full of moong dal batter and don’t spread. Cook covered on low flame till bottom turns golden brown. Turn on other side and cook till done. Cool to room temperature and either chop or tear the moong dal dosa into big pieces. Heat oil in a pan on medium high heat, add cumin seeds. When cumin seeds start to brown, add chopped onion, ginger garlic paste and green chiles. Fry for a minute or two, stir in chopped tomatoes and cook till tomatoes soften and become mushy. Then add garam masala powder, red chilli powder and salt. Cook briefly and remove from heat. 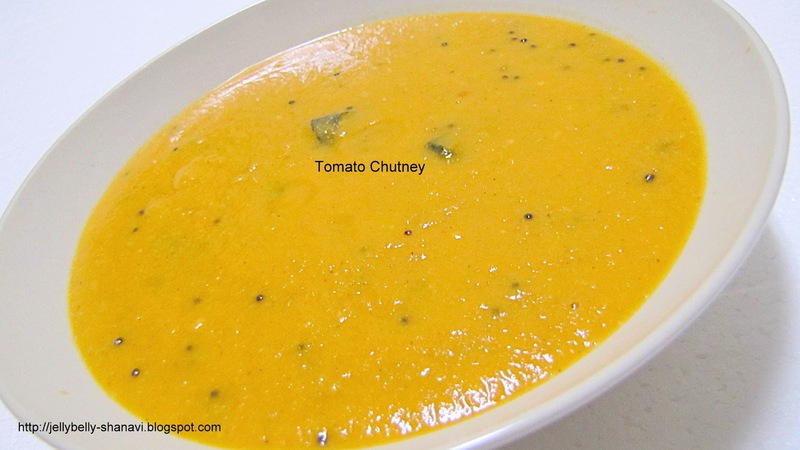 Let the tomato mixture cools down a little, stir in chopped moong dal dosa. Mix and let it stand for couple of minutes. Serve moong dal dosa curry with steamed rice and dollop of ghee. Recently i prepared some sprouts using moth beans/matki beans which ressembles quite like green whole moongdal, they turns out super prefect and i couldnt stop adding in my daily menus, here comes one among the salad i prepared using those sprouts with grated fresh beets and thinly sliced cucumbers which i dressed up with yogurt,salt and pepper powder, its a very simple at the same time quick salad to enjoy without any guilt.....The grated fresh beets gives a crunchiness to this salad and the cooked moth beans tastes marvellous along with beets and cucumber..Prefect for a evening dinner...We loved it..Sending to MLLA#31th Helping guest hosted by Simona, event by Susan. Ridge gourd is peeled and the skins are ground into paste. The ridge gourd skins mixture is then fried in tempered oil along with boiled moong dal. Serve ridge gourd skins with moong dal over plain steamed rice and dollop of ghee. 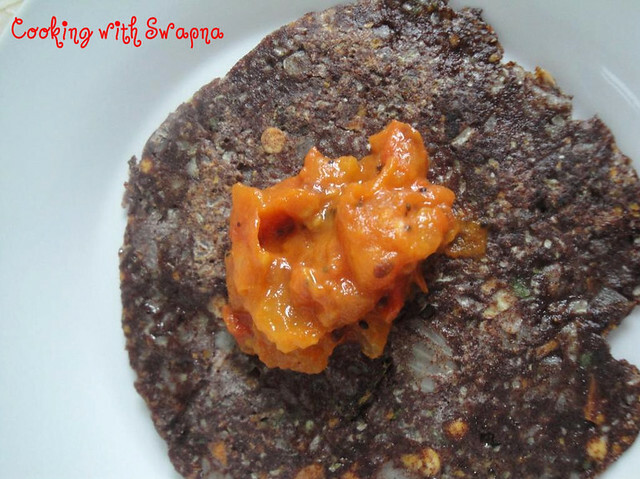 Makes: around 3 Servings of Ridge Gourd Skins with Moong Dal. Refresh moong dal under water thoroughly. Bring to boil few cups of water, add moong dal and boil till moong dal turns soft but not mushy. Strain the moong dal and keep aside. Lightly scrape, wash and remove ends of the ridge gourd. Chop into 3 inch long pieces and eventually chop the skin off of the ridge gourd. Chop the ridge gourd skins into small pieces. Grind the ridge gourd skins into coarse paste using sufficient water (around 1 Cup). When mustard seeds start spluttering, add garlic cloves and green chiles. 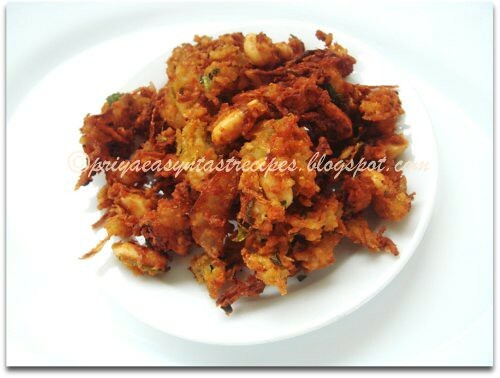 Fry for a minute, add ground ridge gourd skins and fry till the mixture loses the bright green color. Once the ridge gourd mixture is cooked, stir in strained moong dal, turmeric powder and salt. Mix thoroughly and cook for a minute or two to evaporate any excess moisture. Serve ridge gourd skins with moong dal over plain steamed rice and dollop of ghee. Notes: Make sure moong dal is not over cooked. Somehow for the past three months or so, I have been on a rice free diet for no reason. During lunches, my regular dal - subzi are being eaten with a small quantity of cooked cracked wheat (godhuma annam) or quinoa. From years now, I have been using cracked wheat to prepare bisibele bhath and pongal and so in a way I am used to cracked wheat. So far, no cravings for rice that has been a mandatory item on my lunch plate, all my life. Here is the savory version of cracked wheat pongal that I had prepared for today's prasadam that was my midday meal as well. 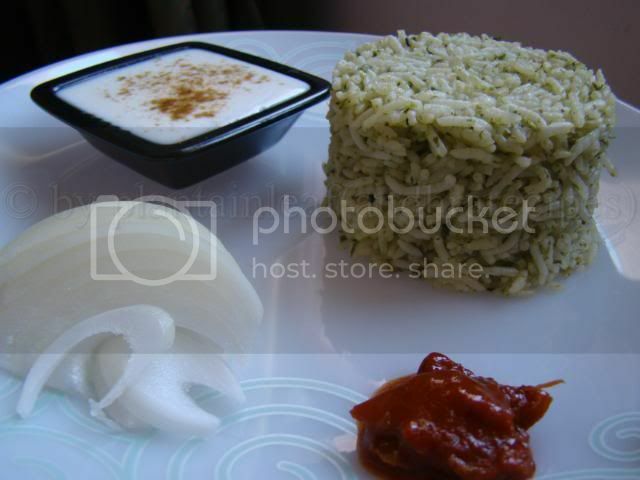 It tastes as delicious as the rice pongal and one wouldn't miss the rice in this dish. The pongal with the goodness of the wheat - moong combo paired with the rich creaminess of milk and subtly spiced with pepper and ginger is sure a treat for the gods and the human palates. Roast the moongdal on low flame for a couple of minutes and remove from fire. Add the cracked wheat, moong dal, turmeric powder and peppercorns to a sturdy pot and also add about 3 cups of milk (or water) and keep cooking on medium flame. Keep stirring in between and also add the remaining water as needed while the cooking progresses. Cook till the dal is done and add salt. Or to quicken the process, cook the dal and wheat in a pressure cooker adding the liquid as needed. Now heat ghee in a small pan and add the grated ginger. When it starts to turn brown, add the remaining tadka ingredients and sauté for a few more seconds. Remove from heat, add it to the cooked pongal and mix well. 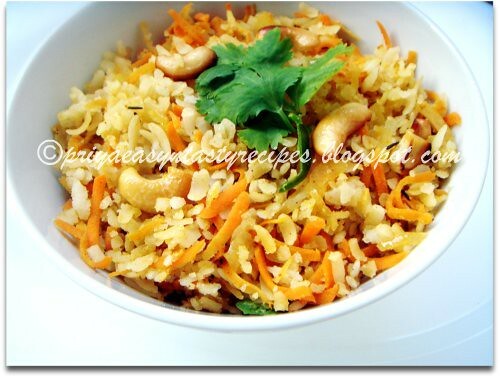 If u searching for a quick breakfast or a simple dinner else for an easy breezy lunch, u will definitely love this quick masala poha with some grated carrots, u can add many colourful veggies to this masala poha as u desire and turn them as a super colourful dish,eventhough i went simply for some carrots...This masala poha tastes fabulous when served hot and they get ready very quickly...U can also enjoy this dish even for snack with a cup of coffee,yep they can be a prefect filling food to enjoy anytime..I used caraway seeds/Shahjeera for tempering and this seeds gives a distinct flavour to this simple masala poha..
Ridge gourd is peeled and chopped into chunks. Chopped ridge gourd is then slowly cooked in freshly ground masala having onion and spices. 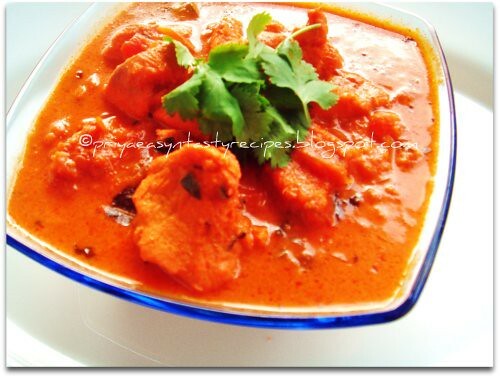 Serve ridge gourd onion masala curry with steamed rice. Makes: around 3 Servings of Ridge Gourd Onion Masala Curry. Peel, remove ends, wash and chop ridge gourd into small chunks (around 2 Cups). Grind onion, garlic, red chiles, cumin seeds, mustard seeds and salt into smooth paste using a spice blender. Alternatively, use a mortar and pestle to grind the masala ingredients for best texture. Heat oil in a pan, add ground masala paste and curry leaves. Fry briefly for couple of seconds, stir in tomato, chopped ridge gourd, turmeric powder and salt. Add few splashes of water and cook covered on low flame for around 10 minutes or until ridge gourd turns soft. 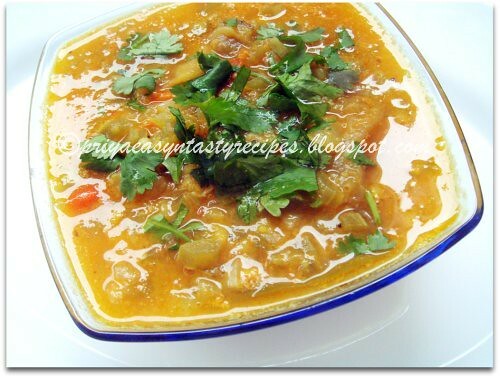 Once ridge gourd is cooked well, remove from heat and serve ridge gourd onion masala curry with steamed rice. Notes: Make sure ridge gourd is cooked properly. Most of us know very well that batata vada is quite a popular Mumbai street food, i tried the same batata vada just by adding few rice flakes and turned them as batata poha vada, needless to say that this batata vada tastes marvellous for evening snacks with a cup of coffee or tea..Adding poha to the usual batata vada turned these vadas truly yummy, definitely a fabulous twist to the usual ones...Sending to Kurinji's Healthy Recipe Hunt-POha..
Makes: around 4 Servings of Cauliflower Curry with Dill. Remove outer leaves, hard stem and break the cauliflower into very small florets (around 2 Cups). Chop the hard stems into small pieces. Thoroughly wash the chopped cauliflower. Wash and chop tomato into big chunks. Separate, wash and chop the dill leaves. Heat oil in a pan on high heat, add garlic cloves and fry till aromatic. Stir in cauliflower florets and fry for couple of seconds. Lower the heat, cook covered till cauliflower is just soft but whole. Uncover, increase the heat, stir in onion and fry till onion turns translucent. Stir in garam masala, red chile powder and chopped dill. Fry briefly, remove from heat and add salt and chopped tomatoes. Serve cauliflower dill curry with steamed rice or with roti. Notes: Make sure cauliflower is cooked well before adding masalas. Choose very tender cluster beans for this curry since we keep them whole for the recipe. If you don't find then tender enough, you can break them into 2" pieces. 1. Mix flour mixture. Add water carefully to knead a dough. Make small balls and press to make small discs(dhokli). Cover and set aside. 2. Heat oil in a saucepan. Add tempering ingredients. As they sizzle, add cluster beans and water. Let them cook. 3. Add 1 cup water, salt to taste, jaggery, mild chili powder and coriander-cumin powder. 4. As it comes to boil, slide discs/dhoklis. Let them cook in the gravy. Add more water if necessary. When they are fully cooked, switch off the gas. Cover. 5. There should be some gravy to this curry. 1. You can steam cluster beans before adding to tempering. This step will save some time. Just usual daily daal gets a kick by the addition of Garlic pickle! 2. Heat oil in a saucepan. Add mustard seeds, turmeric powder, asafoetida. 3. As they sizzle, take the saucepan off the heat. 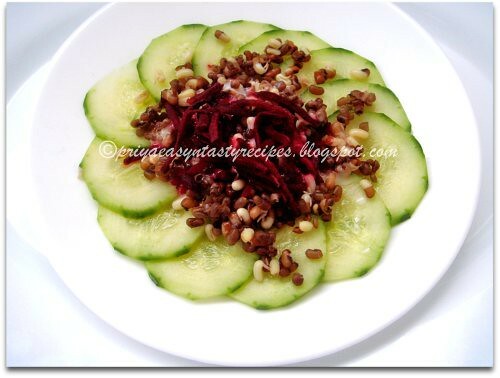 Stir in mashed pickle. Give a quick stir. 4. Now return to heat. Add mashed daal and 1/2 cup water. Stir. 6. When daal comes to boil, switch the gas to low. Simmer for 5 minutes. 1. Take the saucepan off the heat before adding garlic pickle because all the spices in the pickle may burn. 2. You can adjust the consistency adding more water. 3. Pay attention while adding salt since pickle already contains salt. 4. This recipe serves 2 people. I feel that eggplants and potatoes are two vegetables in Indian cuisine that can be prepared with myriad variations, each one being equally delectable. Eggplants particularly happen to be a favored one in a traditional Andhra kitchen and this recipe follows that style of cooking. Eggplants are cooked almost but not mushy (hence the name muddha) and then the flavorful besan goes in. From prep work to finish, it took me less than 15 minutes for this subzi and an apt one to appear in this series of 'simple and quick subzis'. Heat oil in a sauté pan and add the chana dal, urad dal and mustard seeds. When mustard seeds start to pop and the dals start to turn reddish, add the curry leaves, turmeric powder and the eggplant cubes. Cook on low flame till the eggplants turn just tender, keeping the lid covered. Then add the besan, chili powder and salt to the cooked eggplant and mix well. Taste and adjust their quantities if needed. Cook a few minutes more till the raw smell of besan disappears. If the mixture appears too dry, a little oil can be added. Turn off the stove. Raw rice is coarsely ground using a blender. The ground rice is then cooked in water along with moong dal till rawa is completely cooked. Uppudu Pindi is served with mango pickle or with yogurt. 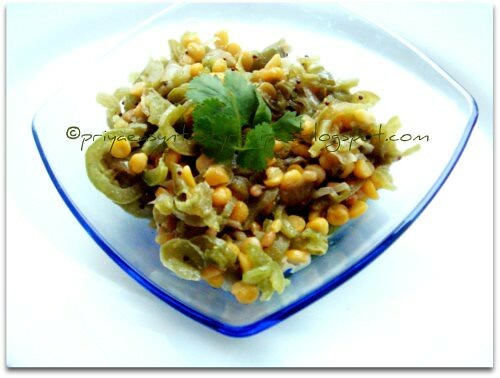 Makes: Rice Moong Dal Upma. Fry briefly, pour 2 1/2 cups of water, moong dal and salt. Bring the water to boil, let the moong dal cook for couple of minutes. When moong dal is almost cooked, add ghee and rice rawa. Remove from heat, fluff up the upma and serve with pickle or yogurt or both. As I mentioned a few times in my earlier posts, what garlic is to me is coconut to my husband. He can't even stand the smell of coconut and so this curry never happens at my home. Usually capsicum is cooked either this or this way. In my mother's kitchen, it is all together a different story. Any thing coconut is appreciated and all most all koora - pulusus (subzi / dals) are usually laden with coconut for that sweet flavor. And this is the only way my mother cooks capsicum, that also happens to be my father's favorite version. 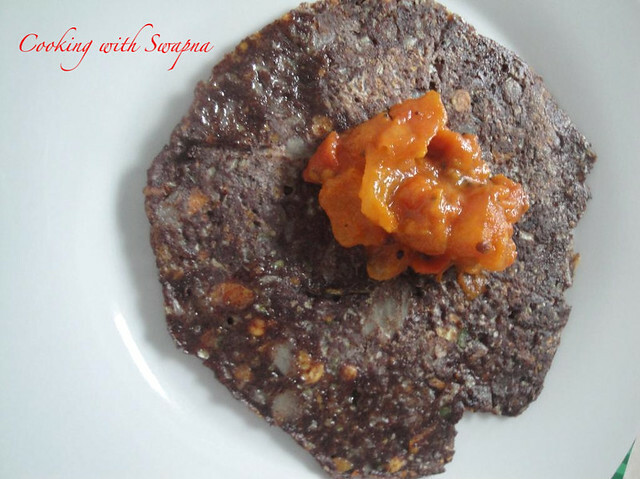 I had prepared this capsicum - coconut koora when my parents were visiting us, last summer. Heat oil in a kadai or a non stick pan, add the dal and mustard seeds and sauté for a few seconds. When the dal turns reddish and the mustard seeds start to pop, add the chopped capsicum. Stir well once and cook the capsicum on low flame, covered. Keep stirring in between till the capsicum turns tender. Then add the coconut, chili powder and salt to the cooked capsicum and mix well. Heat for 2 -3 minutes more and turn off the stove. I tried this unusual combo for sambhar since there were some leftover snakegourd pieces and eggplants..For my surprise this combination tastes marvellous when served with hot steaming rice topped with ghee and with fried papads, we had a fabulous lunch today..This sambhar was absolutely comforting,goes awesome even along with rotis,idlies or with dosas.. 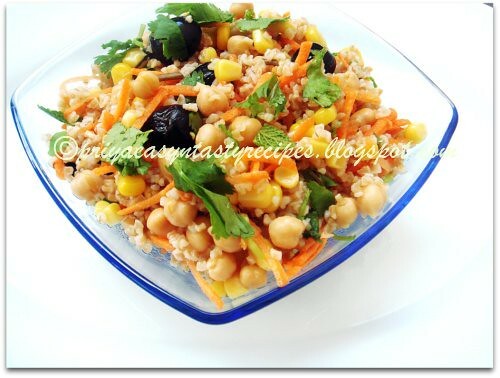 If u r searching for a complete healthy salad, this bulgur and chickpeas salad is for u..I tried out this salad with cooked bulgur ,chickpeas and with some grated carrots,sweet corns,black olives along with few chopped coriander leaves and mint leaves for our saturday dinner..This salad tastes marvellous and sounds exactly like tabbouleh, the popular Lebanese salad prepared usually with bulgur and tomatoes..I have completely skipped the tomatoes in this salad and tried adding more veggies, this salad looks very colourful, yummy,healthy,filling and prefect to carry for picnic..We loved it..
A simple stir fry from my MIL's kitchen. 1. Steam tindora and potatoes in a pressure cooker. Take care not to overcook the veggies. 2. Heat oil in a saucepan. Add the ingredients for tempering. 3. Saute till garlic appears crispy but not burnt. 4. Add mild chili powder, coriander-cumin powder, salt, sugar. 5. Add veggies along with cooking liquid. 6. Cook for 7 minutes till all the liquid evaporates. 7. Serve hot with rotlies. 1. You can also cook the veggies in the saucepan itself instead of the pressure cooker. It will take more time. Add water and cover with a lid to cook. Olive oil --- 1 tab sp (you can use( ghee)clarified butter or any other oil if u like. Salt --- 1 &1/2 tea sp or according to your taste. 1.Make a coarse paste of spinach.coriander,green chilli,garlic and cumin seeds in a food processor. 2. Cook rice with 3 cups of water and tea sp of oil and let it cool . 3.Now heat remaining olive oil in a pan and add cinnamon,cardamom let them popup then add the ground paste, salt, give a nice stir then add cooked rice immediately and cover with a lid switch off the heat, leave it like that till you serve. 4. Just before you serve remove the lid and mix well to combine the flavours well and serve with pickle,curd and salad. 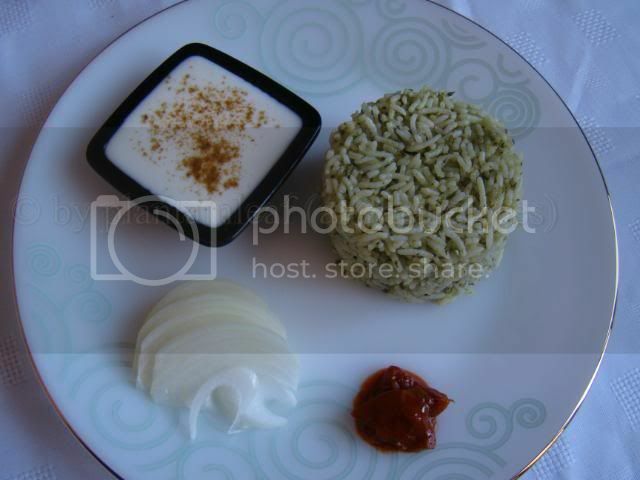 You can serve with fried eggs or fried fish or chicken on top of this rice in a bowl with salad as a one bowl meal.. 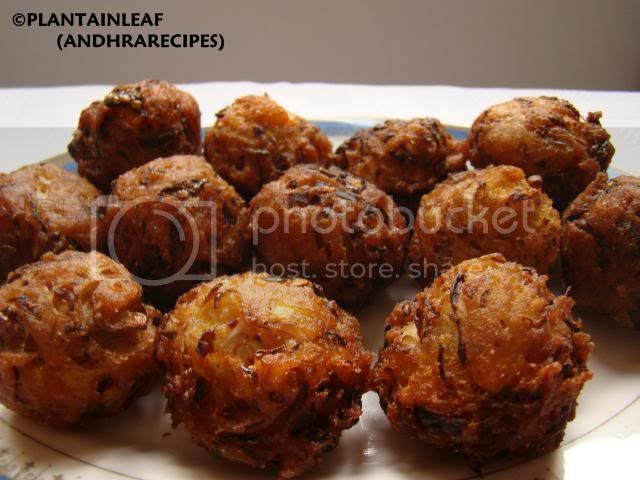 The Konkani word "Chettambade" indicates flat vadas/fritters. It also goes by the name "daal vada" in Mumbai. I tried to recreate my grandma's signature recipe which used to be crispy from outside and soft from inside. 1. Drain soaked daal. Keep 2 tbsp daal aside. 2. Grind the daal with remaining ingredients for grinding. 3. Stir in 2 tbsp daal and curry leaves, coconut pieces, onion and cilantro. 5. Add 1 tbsp super hot oil to the batter. This makes vadas crispy and fluffy. 6. Make 16 small balls. Flatten them with hand. 7. 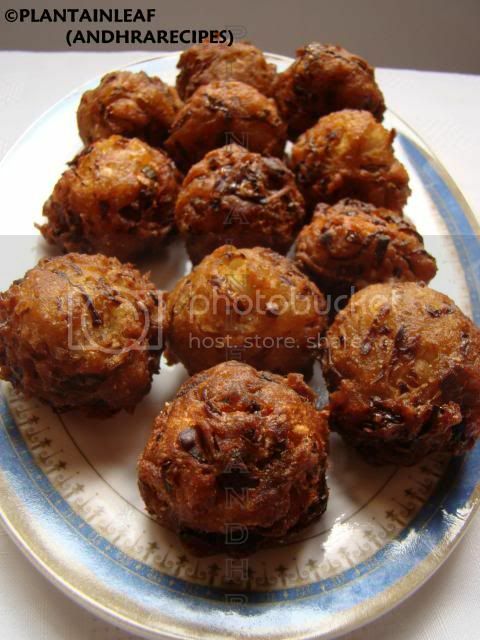 Deep fry the vadas till they are darkish brown in color. 1. 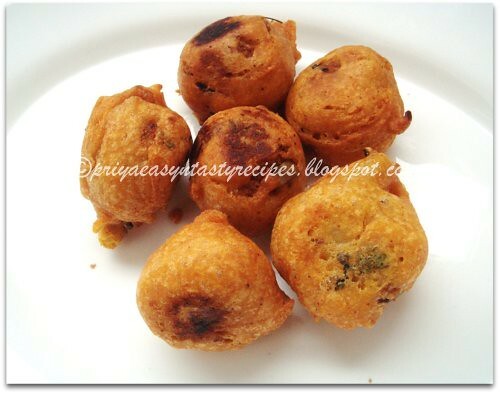 Frying these vadas can be tricky. They will appear to be ready but may not be cooked through. So make sure to fry on medium to low heat. So they are cooked well but not burnt. This is the recipe I had at my friend's place many moons ago. I gave it this name "Punjabi Kobi". I tried to recreate the recipe by a dash of this and a smidgen of that. So I am not claiming its authenticity. The subzi has a distinct flavor of ajwain seeds. If you are not fond of that spicy flavor, skip it or use just cumin seeds. 1. Heat oil in a nonstick kadai or wok. Add all the ingredients for tempering. 2. As they sizzle, add onion & ginger. Saute till onion is soft. 3. Now, add potatoes and stir fry till they are half-cooked. 4. Add shredded cabbage, chili powder, garam masala. Stir fry till potatoes are fully cooked. 5. Add salt and amchoor powder. 1. Make sure that potatoes are half-cooked before adding cabbage. Otherwise, cabbage will cook quickly and potatoes will remain uncooked. 2. Since it is a stir-fry recipe i.e. water is not added for cooking, more oil is required. I use nonstick kadai/wok to use less oil. Whenever we went to any Udipi restaurants in Mumbai, my cousin always ordered Dahi-Idli (just for the record, I always stuck to my Rawa dosa! :-) It almost tastes like dahi vada but you miss all those deep fried calories. Here's my version. 1. Warm leftover idlies and make sure that they are at room temperature. 2. Divide idlies in 2 serving bowls. 3. Pour sweetened yogurt over each bowl. 4. Heat oil in a small saucepan. Add the tempering ingredients. Drizzle the hot oil over idlies. 5. Sprinkle the chaat masala and paprika. 1. If yogurt is too thick, you can add a spoonful of water. 2. You can also add a few curry leaves and 1 red chili, halved - in tempering. 3. I used nonfat, plain ogurt. For creamier/richer taste, you can use full fat yogurt. 4. This recipe serves 2 people. You can easily increase the quantity for more people. When you buy a huge pack of garlic from Costco, and feel lost about it after coming home - this recipe comes handy. Just remember that this pickle has a short shelf life! 1. Heat oil in a saucepan. Add garlic cloves. Saute on a medium heat for 5-7 minutes without letting them burnt. 2. Take off the heat. Let it cool down completely. Do not cover. 3. Add Gujarati pickle masala. Check for salt. If it has salt, you may not need to add any salt. 5. Refrigerate. Use within 1 week. 1. This pickle is used as a condiment as well as an ingredient for several Gujarati dishes. 2. This pickle gets dry when kept in fridge. You may need to squeeze some lemon juice to refresh it before serving. This time I made both fruit cake & stollen for this new year. I soaked the fruits in the rum for one week. 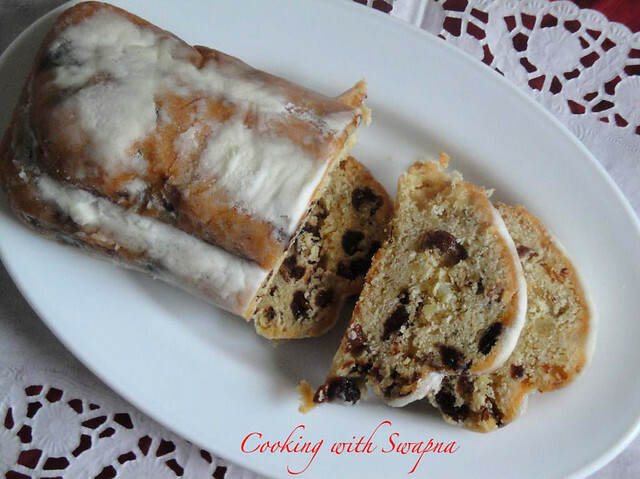 Little different from regular stollen, as I used quark in this preparation. It taste delicious. When the stollen has cooled down completely on the cake rack, wrap it first in aluminium foil, then a plastic bag, for instance, a freezer bag. If stored in a cool and dry place, the stollen will remain fresh for up to 4 weeks and the aromas of the fruit and spices will develop fully. Perfect for parties. 1. 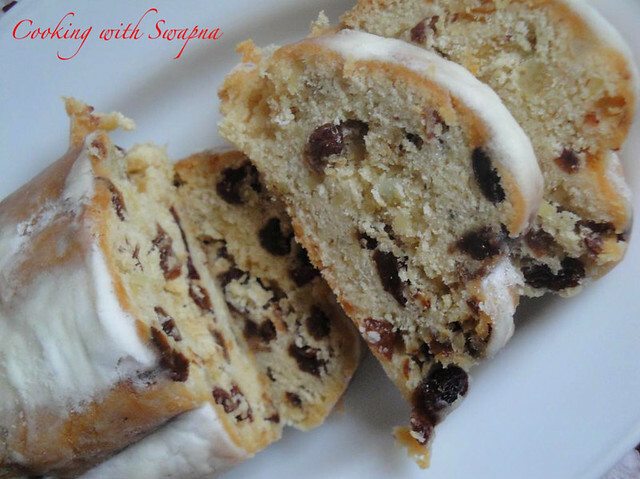 For the dough, pour rum over the raisins and leave to soak overnight ( I soaked it for 1 week). 2. Line the baking sheet with baking parchment. Preheat the oven about 250 C.
3. For the dough, mix the flour and baking powder together. Add the other ingredients for the dough (except for the almonds, candied lemon peel and candied orange peel) and knead everything. 4. Then knead the almonds, candied lemon peel, candied orange peel and soaked raisins into the dough on the lightly floured work surface until all the ingredients are well incorporated. 5. Roll out the dough to make a square. Roll up the dough, starting from the long side, then with the rolling pin make a depression lengthways. Now fold the left side over the right side but slightly offset. Again using your hands, make a bulge lengthways along the middle. 6. Place the stollen on the baking sheet and put this in the bottom third of the preheated oven. 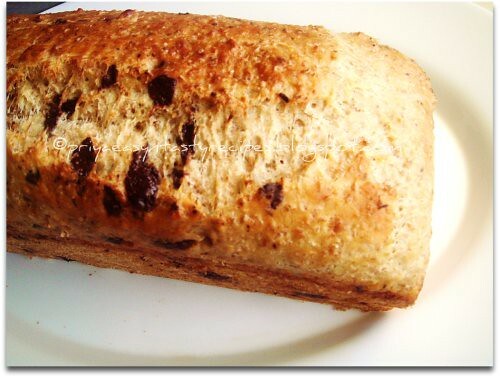 Bake the quark stollen for about 55 mins. 7. Melt the butter in a small pan. Brush the stollen with half the melted butter immediately after you have taken it out of the oven and sprinkle half the icing sugar on top. 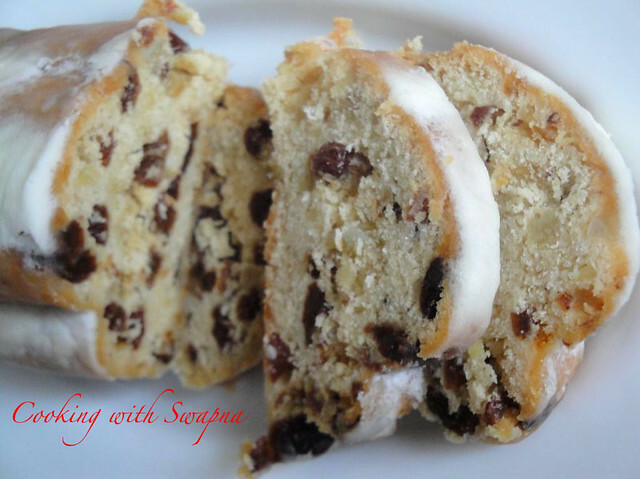 Put the stollen on a cake rack to cool a little. Then repeat the same with the remaining butter and icing sugar. 3.Slowley droop this balls in to hot oil and fry in to a golden brown color. 4. Remove from oil an dplace the on a kitchen towle to remove if any extra oil. I have been eyeing these radishes for years now in our local grocery store but never thought of trying them. Mainly because I would get the regular radish / daikon at half the price and didn't want to shell out the extra bucks for the black peel that would end up in the garbage. Last weekend, however I was in a generous mood I guess and brought home some. Black radishes - well, as the name suggests are another variety of radishes with a black skin. They are about the size of turnips / kohlrabis. They smell and taste similar to the regular white radishes, the tiny pink ones or the daikons. 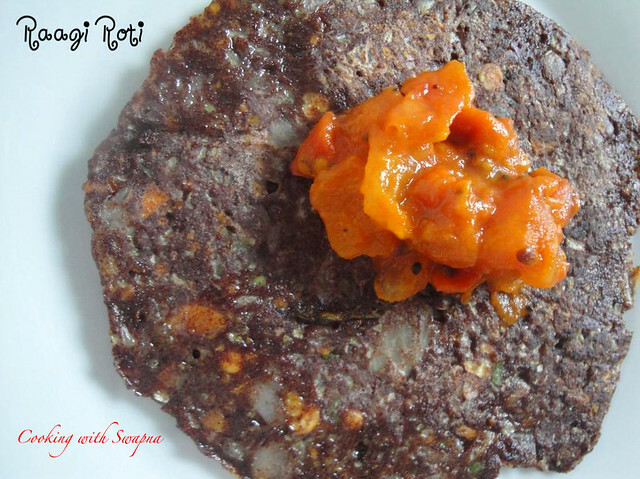 I used some in the methi mooli rotis and some to prepare this koora today. Any radish / daikon can be used to prepare this simple and quick curry. And here is the recipe for radish lovers. Heat oil in a small kadai / a non-stick pan. Add the tadka ingredients in the order mentioned except the turmeric. When the dals turn reddish, add the green chillies and turmeric. Stir for a few seconds and then add radish and peas, if they are fresh. Turn the heat to low setting and cook covered, stirring in between. Sprinkle a few Tbsps of water if the mixture appears very dry. If adding frozen peas, do so almost at the end of the cooking. Add salt and mix well. Turn off the heat. 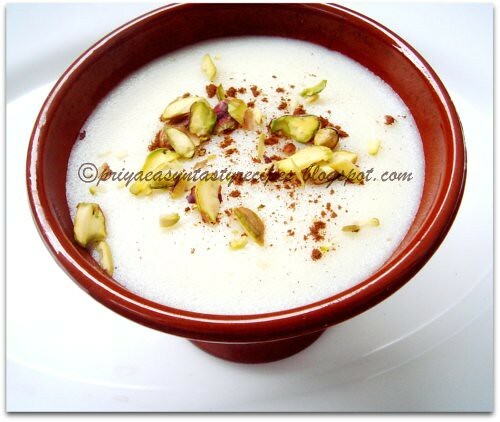 Serve with rotis / rice. 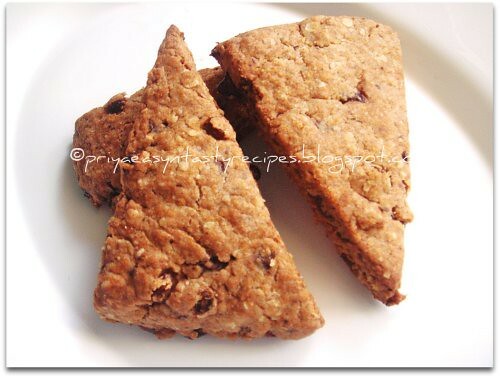 Its has been a long i prepared scones for breakfast, scones are really handy,healthy,filling and when dipped in hot chocolate or coffee they tastes absolutely fabulous, everyone at home love scones specially if they are prepared with chocolates, this time i prepared this scones by adding few raisins which are quite popular for their antioxidants along with chopped dark chocolate chunks.. Also i prepared this scones completely healthy with wholewheat pastry flour and rolled oats, its completely egg free,sugar free since i went for maple syrup and apple sauce, both together turned out these scones prefectly with mild sugar, if u dont have maple syrup u can go very well for sugar or else for honey...A prefect breakfast scones to enjoy without any guilt to kick start a day.. This 2 tier sandwich has a unique flavor as it has ingredients like celery, oregano and olive oil in one tier and a tangy mint chutney to compliment it in another tier. I prepared this sandwich recently for my hubby and he loved it as it had a lot of flavors embedded in it with a mild crunch to dig your teeth into. I can guarantee this sandwich with its refreshing flavors would win many hearts.!! Take all the ingredients of chutney and grind to a fine paste and keep aside. Heat olive oil in a pan and add celerey,garlic,onion till onion becomes translucent. Then add bell pepper fry for a min then add tomatoes and fry till it becomes soft. Then add the oregano,salt and chilli flakes. Stir and keep aside. Take one bread slice apply the chutney and place a couple of slices of tomato, onion, carrot, cucumber and cover with toasted slice. Now spread the bell pepper mixture on the other side of toasted slice, sprinkle grated cheese and cover with the 3 bread slice. Toast it on tawa or grill sandwich maker and serve hot with some ketchup.